Over the centuries, the plaza has taken its various names from the monuments that surround it. At first it was the church, when it was called the Plaza de la Iglesia. When the Holy Tribunal of the Inquisition set up operations here in 1614, it became known as Plaza de Inquisición. Today, it’s a shady hangout surrounded by beautiful colonial structures - the Baroque Inquisition Palace, the Government Palace, the Gold Museum and the Bank of the Republic. People usually come here for some respite from the heat. You might see some people playing chess. In the evening, it tends to become lively with dancers and musicians. 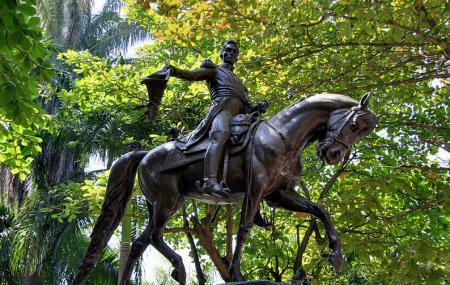 There’s a large 1896 statue of Simon Bolivar sitting astride a horse in the center of the square. Fun shaded square to get out of the Cartagena heat. Lots of vendors around selling water too. Good place to sit and people watch. This is the bustling center of old town Cartagena. There always seems to something happening here. You'll find dancers, vendors and a parade of locals and tourists passing through. Nearby, you can find coffee shops, restaurants and boutiques. The harbor and city walls are a short distance away. It's worth a visit at different times of day as the light and the mood of the square will change. Lively bustling plaza. Heart of historic Cartagena must see , lots of activity and shops etc. Check airbnb for a top floor apartment with balcony overlooking the park/plaza where all the action is at and way cheaper than a small stuffy hotel room..Early evening was the best time for people watching as the dance troupes visited the park and the wide assortment of food carts.